Why Did FBI Monitor Occupy Houston, and Then Hide Sniper Plot Against Protest Leaders? | Democracy Now! RYAN SHAPIRO: Absolutely. First I should say that this is a really weird and crazy story, and I’m still trying to make sense of it, and I’m working with my attorney, Jeffrey Light, and the journalist Jason Leopold to that end. But the judge’s ruling is terrific on this point. In this case, Judge Collyer made a wonderful ruling and said, “No, you can’t just say the words. The words aren’t just talismans—terrorism, national security. You have to back them up. You can’t just wave them around like magic and expect us—expect the court to give you what you want.” And so now the judge has required the FBI to provide substantiation for their seemingly preposterous claims that Occupy Houston were terrorists advocating the overthrow of government. And the FBI has until April 9 to provide this support. They can do it openly or they can do an ex parte in camera declaration, so a secret submission to the judge where she can review the documents herself. AMY GOODMAN: And what about this assassination attempt against Occupy activists? RYAN SHAPIRO: Yes, absolutely. As I said, I’m still trying to figure out exactly what’s going on there, but what I want to know is, first of all—so my requests here are in part inspired because I want to know what the role of the FBI is in coordinating the response to the Occupy movement, why the FBI considered the Occupy movement a terrorist threat, and I also want to know why the FBI didn’t inform the protesters of this tremendous threat against them. As Kade Crockford at the ACLU recently said, if the targets of this plot had been Wall Street bankers, I think we can all safely assume that the FBI would have picked up the phone. AMY GOODMAN: And called them. RYAN SHAPIRO: And called them, yes, absolutely. So—and, finally, I want to know—and because this is how it appears in the documents—of course, they’re heavily redacted, so we’re not sure—but why was the FBI appearing to pay far more attention to peaceful protesters in their investigation than to the actual terrorists who were plotting to kill those protesters? AMY GOODMAN: We’re talking to Ryan Shapiro. He has been called a ”FOIA superhero” for his skill in obtaining government records using the Freedom of Information Act. Today we are revealing on Democracy Now! 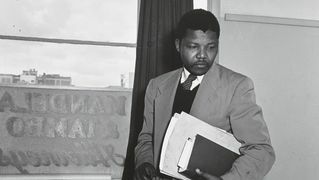 he is suing several federal agencies, a lawsuit that was just filed today, including the NSA, for their failure to comply with FOIA requests regarding former South African President Nelson Mandela. Ryan Shapiro is a Ph.D. candidate at the Massachusetts Institute of Technology, where he’s received tens of thousands of FBI files on the animal rights movement, which is what we’re going to take up next. His dissertation, called “Bodies at War: Animals, Science, and National Security in the United States,” the FBI has called a threat to national security. We’ll ask Ryan Shapiro why. Stay with us. NEXTWhy Did the FBI Label Ryan Shapiro’s Dissertation on Animal Rights a Threat to National Security?